FROGTECH's signature product is SEEBASE™ – a structurally enhanced depth-to-basement model that is the core of our multi-client regional studies and consulting services. Defining basement architecture, SEEBASE forms the basis for the systematic assessment of exploration strategies and petroleum systems evaluation. It is available as part of our Regional Basement Studies and for flexible delivery as part of Global SEEBASE D2B. Our SEEBASE methodology results in the best possible model for the 3D geometry and depth of the top basement surface. 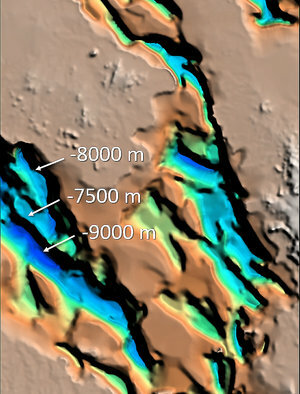 In contrast to basement models produced by inversion of one or more potential field datasets, the SEEBASE workflow allows the interpreter to incorporate information from a wide range of datasets and integrates our understanding of the nature of basement and our structural model of basin evolution. SEEBASE is calibrated using a wide variety of datasets including processed potential field datasets, geophysical modelling, surface geology, terrane/basement geology, plate reconstructions, tectonic events, kinematic analysis, rock properties, seismic data, cross-sections and well data. Depth to basement generated through gravity inversion..
SEEBASE 3D depth-to-basement model revealing superior structural architecture. SEEBASE can be improved with the availability of higher resolution potential field datasets and the integration of higher quality calibration data such as wells and seismic. Frogtech’s workflow and GIS systems, developed over 20 years, allow rapid upgrading of SEEBASE depth-to-basement model in areas of interest. Tell us about your area of interest. Thank you! We will be in touch shortly to arrange an initial scoping discussion. When seismic is not available, or does not image basement, our SEEBASE workflow is able to extend the view of the basins by using our proprietary potential field geophysics, structural model, and iterative integration of multiple constraining datasets. Potential field data used in combination with outcrop, well and seismic datasets, Frogtech Geoscience can extract more geological information, and calibrate with higher confidence, than would otherwise be possible using individual datasets. To find out more, email info@frogtech.com.au or visit our pages on global SEEBASE Depth-to-Basement, regional SEEBASE products, consulting services, government solutions, or our heat flow product Terraflux.